Britney Spears Takes Sons to Las Vegas! Britney Spears is back in Las Vegas -- and this time, she brought her two sons with her! The singer and sons Sean Preston and Jayden james were spotted at Mandalay Bay yesterday, where the family saw an afternoon performance of Disney's "The Lion King" musical. 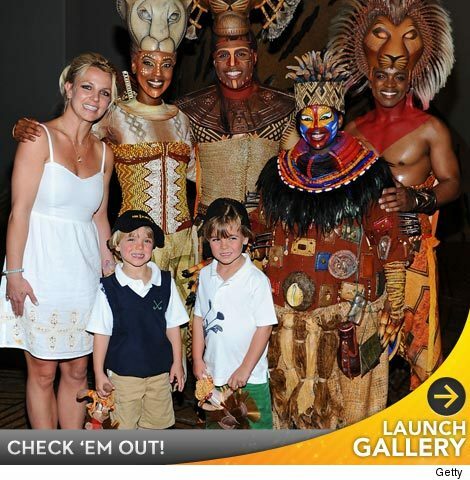 Britney, who performed songs from "Femme Fatale" at the Palms the weekend before, brought her boys backstage after the show, where they met the stars -- where Jayden told the actor who plays Simba's dad, Mufasa, "Hey, I saw you dead!" Check out the family photos! Video: Britney Spears Does 'Jackass' Sketch for Kimmel! Britney Spears' Stage Style -- Her Hits & Misses! Britney Spears Performs on 'GMA,' Announces New Tour!